We are so excited to announce that we have won the Grand Prize from KIND Snacks #Morekind “Nice” Vs. Kind video contest! Watch the video to see what we plan to do with the winnings – and the wonderful surprise we got from KIND Snacks founder and CEO Daniel Lubetzky. We can’t thank KIND snacks enough for helping us ensure that Rees’ legacy will continue to cultivate kindness and teach water safety for many years to come. Our son Richard Edwin-Ehmer Specht (Rees) drowned in 18 inches of water. A simple miscommunication between my friend and I meant that one of the most crucial layers of protection from drowning had broken down. Had Rees started swim lessons as an infant (like his younger sister, Melina has) he would probably be here today. Nothing can bring our son back, but our joint effort with End Drowning Now and Saf-T-Swim swim schools is trying to make sure that we don’t lose any more children to drowning. Help us teach children to ReesSpecht the Water. Drowning remains the number one cause of accidental death of children aged 1-4. Help us change that number to 0! Click on card to order! 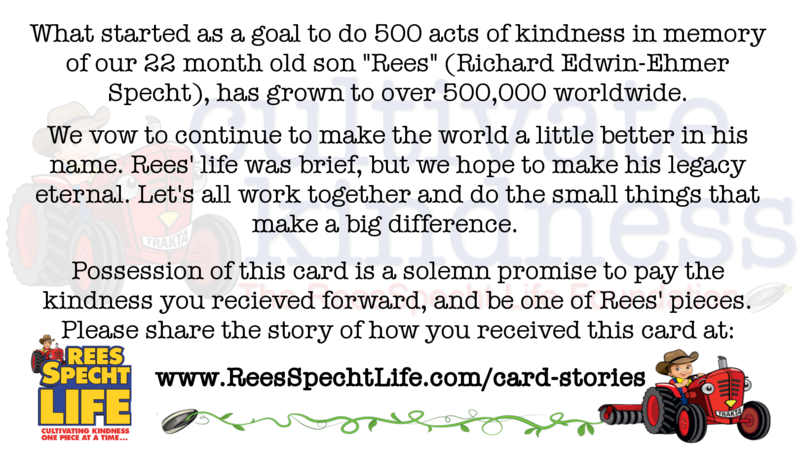 We now have a limited number of these special cards available through our online shop. Don’t worry, you can still order our regular cards (orders of 5-10 are still completely free)! Click HERE to order your set of 20 or 100. These last five years have proven that kindness truly makes a difference. Your support helps us to continue to prove this. 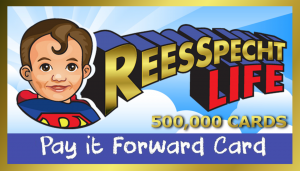 The ReesSpecht Life Foundation wouldn’t be where it is today without your continued support. Thank you, from the bottom of our hearts. What’s the difference between “Nice” and “Kind”? 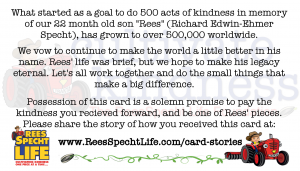 Your vote will help us continue spreading the seeds of kindness in Rees’ name and make what would have been his 7th birthday an even bigger celebration of Kindness. Thank you all. From the bottom of my heart. Help us win $2500 with a simple click! One single click on the following link and choosing ReesSpecht Life will help us win $2500 from NEFCU this year! Last year we won a similar contest from them and proceeded to donate our winnings AND match the same for the two charities that finished in second and third place (that contest only paid the winner!). This year we are hoping your support will allow us to win again! 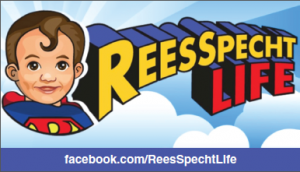 Simply click on the following link and choose ReesSpecht Life as the charity! You can vote 1 time per day over the next ten days! Help us win $2500 and keep spreading the seeds of kindness in 2018!